Fills the wanton eye with May’s delight. I couldn’t let May disappear without paying homage to the Hawthorn, sacred tree of this month. 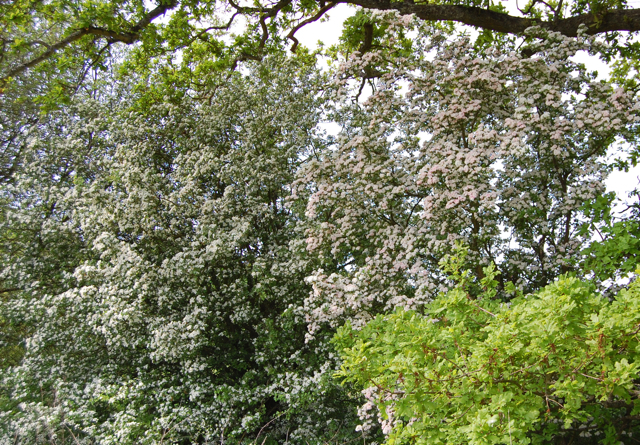 It has been known by many names, including May Flower, May Tree, White May and simply The May, all referencing the beauty, symbolism and medicine of its blossom at this time of year. In fact the Hawthorn provides medicine most of the year round, not just in its blossom, but its leaves and berries too. 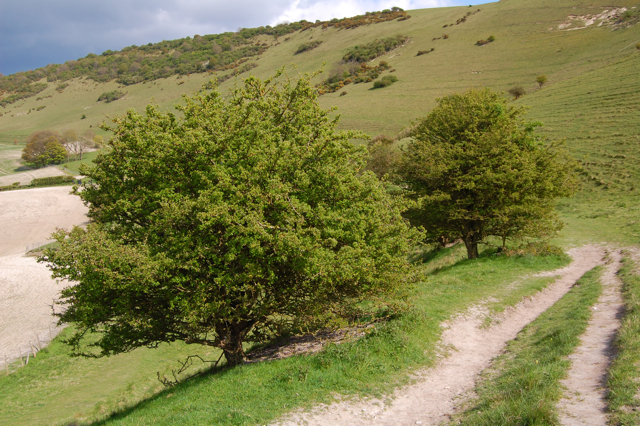 Hawthorns on the Sussex Downs, just before flowering. Hawthorn has been common in Britain for millennia, pollen counts showing its presence here before 6,000 BC, and of all our native trees, it is perhaps the most enshrined in myth and legend. 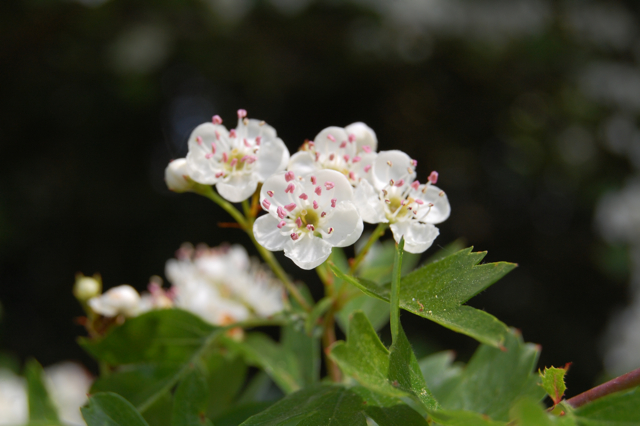 From Celtic ceremony, to Arthurian myth, to Christian legend, the Hawthorn has its place in all the stories that shape our land and our hearts. In pagan spirituality, the Hawthorn was a symbol of fertility, youth and sexuality and was considered sacred to the Goddess. It is believed that in Celtic times, most marriages took place at this time of year, usually at Beltaine, the cross quarter festival marking the mid-point between the spring equinox and the summer solstice. Hawthorn would have been in full bloom, bringing abundant blessings to the newly weds. Today, its historical symbolism and its affinity with the heart have resulted in it being considered the tree of love. Despite marrying in August, we used branches of Hawthorn, among other trees, in our wedding ceremony last year. Reacting against its saucy pagan associations, the Catholic Church made the pure white blossoms a symbol of the Virgin Mary and of chastity. It was also said to be the wood from which the crown of thorns worn by Jesus was made. The Glastonbury Thorn, which flowers once in May and again at Christmas was said to have grown from the staff of Joseph of Arimathea, which took root when he brought Christianity to the British Isles. There are thought to be up to 1,000 species of Hawthorn worldwide, the two most common in the UK are Crataegus monogyna and Crataegus laevigata. Usually white, the blossoms may also be a light or deep pink. In medicine Hawthorn is most commonly associated with the heart and circulatory system. Both the blossoms and berries are useful and many herbalists combine preparations of the two. The berries and leaves are considered warming and drying whilst the flowers are slightly cooler in nature. Seen as a restorative of the heart, it is non-toxic and can be used safely by most people, though some care must be taken with those already on heart medication, it’s best to check with a qualified herbalist in such cases. In fact Hawthorn is regarded as one of the few Western adaptogenic herbs, having the ability to balance blood pressure, aid in convalescence and regulate sleep. As a herb of Mars it was seen as dynamic and stimulating, however it was also considered an antispasmodic and sedative to the nervous system. Like so many of our multi-faceted herbal allies, it’s impossible to squeeze into any one simple definition. Both flowers and berries are healing to the heart muscle and arteries, being rich in flavonoids and other chemical constituents, I’ll be considering the berries in more depth when they are in season. My own experience is that the berries are slightly more stimulating, partly due to their warming quality, where as the flowers make me feel relaxed, comforted and slightly blissed out. The tea has a lovely subtle honey flavour which eases tension and opens the emotional heart. 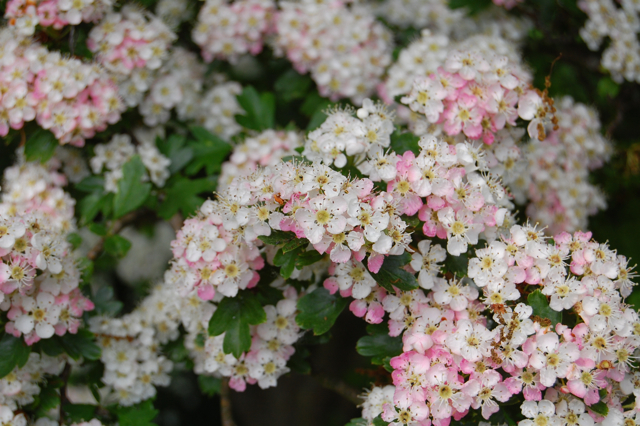 Along with Rose, which I recently posted about, I see Hawthorn blossom as the most important remedy for helping open the heart. See how the beautiful blossoms open to reveal their pink stamens, reaching out. One thing that intrigues me is how both the Hawthorn and the Rose have this incredible affinity with easing our emotional barriers and opening us up to feel and embrace our experiences deeply, yet they both have these very protective and somewhat savage thorns. They seem to symbolise how vulnerability and protection are not mutually exclusive, how being open doesn’t mean being weak. After meditating on this a while I came across this great article by American herbalist Jim Mcdonald who speaks of his experience with thorn medicine. I love the Hawthorn unashamedly and use it mostly as a tea, tincture and flower remedy. A tea made from the fresh leaves and blossoms is my favourite but I usually dry some for use later in the year too. Some people hate the distinctive, musky aroma given off by the pollen during May which is supposed to contain triethylamine, one of the first chemicals produced from dead tissue. To me however, it smells rich and heady and I can always imagine the bees drunkenly loading up on this wonderful springtime treasure! we have a ‘May tree’ in our garden which has been there for at least seventy years (I am sixty and it was a mature tree when I was five), It has pink blossoms, no thorns, always flowered in May and is now dying- little leaf and no flowers this year- maybe as a result of my builders placing their portalu next to it when we had building work done last year, maybe as a result of some of its roots getting cut when new drains were laid. I would like to replace it with an identical or similar tree. Do you have anyidea what its official name might be?and where I could buy one? I mainly work with the wild hawthorn but I know a few cultivars. 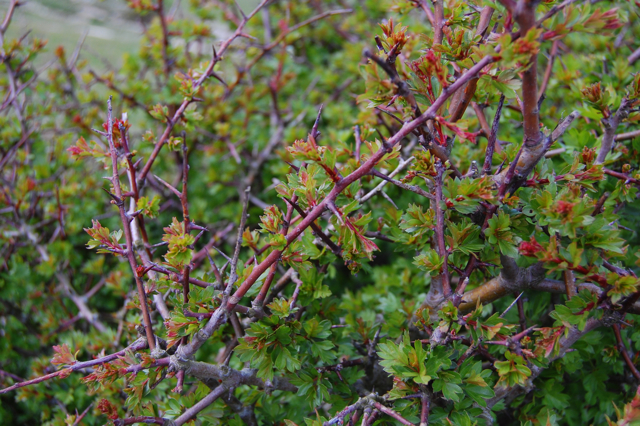 The deep pink hawthorn is a variety called Paul’s Scarlet but this has thorns, as far as I know there isn’t a variety without them. I asked my dad who is a forester and gardener and he said there are over 200 species of hawthorn available to buy but only very few are thornless. He thought it might be Crataegus x mordenensis which can be white or pink. i have a confusion with the name of crataegus oxyacantha and crataegus laevigata.is it the name of same species.if yes then some papers mention only one name and not the other as synonym.i m confused with the identity of crataegus oxyacantha.could u please help to clear this confution. Hi, it is a bit confusing I know. I always thought C. oxyacantha was a synonym for C. laevigata but apparently it has been used interchangeably for both the common UK varieties and as a result it’s generally not in use now to avoid confusion. 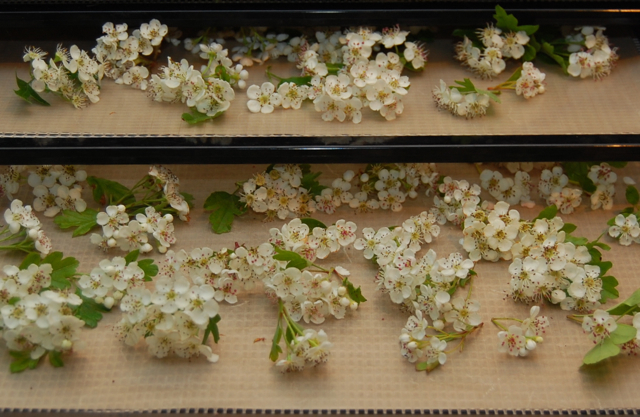 So C. monogyna is the accepted botanical for common hawthorn and C. laevigata for midland hawthorn. Hope that makes things clearer. I have gathered some Hawthorne berries to make a tincture, perhaps I should have dried some flowers in May? Both are wonderful medicine so use either or both as you wish. 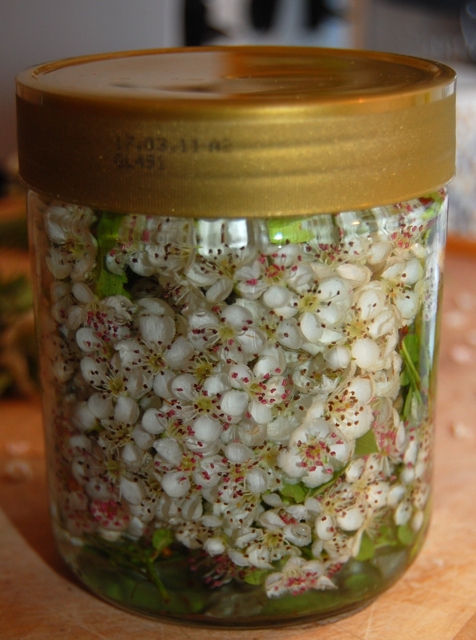 You can always make a berry tincture then add some flowers to it next May if you have any of it left by then! My late son planted two beautiful trees, he said they were Maytree’s. They are full of white flowers in May that later develops to clusters of black berries similar to miniature grapes. We just trimmed the tree’s, i saved some of the branches loaded with berries to decorate my son’s grave with. I also placed some in a vase in our home. I feel it is a shame to burn these branches that I believe must be for some helrbal or medicinal use. Please advise. What a wonderful way to remember your son. There is a species of hawthorn in the US with black berries I believe but it could also be something else. I don’t suppose you could email me a photograph at whisperingearth@gmail.com? This year why has the white flowers turned pink all of a sudden ? There is usually a mix of white and pink blossoms. The hawthorns have been particularly abundant though this year haven’t they! Hi Lucinda, just come across your site! I’m from the UK, and since all the May blossom is coming, I’m wondering if an oil can be made from the blossoms and used externally? Some sites say that you have to be cautious about overusing May blossom and berries. Thank you, and lovely site! Sorry I didn’t reply to this in time! For future reference the blossoms don’t make the best oil, they are better in tincture, tea or vinegar internally or in the bath externally. Yes you don’t want to use a lot of hawthorn internally unless medicinally indicated but simple food preparations like hawthorn berry syrup are fine for most people.